John Mauceri has a good track record with classic film scores and arrangements thereof, as his recent Hitchcock album for Toccata demonstrates (review). 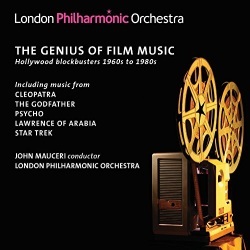 The music on this new album, culled from the first of two live RFH concerts in November 2013, focuses on Hollywood blockbusters from 1960 to 1980; the follow up, which has yet to be released, covers the years 1980 to 2000. Looking through the contents list of this initial instalment some of Mauceri’s choices – the North ‘symphony’, for instance – seem a tad peripheral. That said, he has at his disposal an orchestra that's very familiar with the genre; appropriately enough they start the show with a splendid rendition of the Fox fanfare. Alex North may not be the most distinguished or the most prolific of film composers, but his scores for Stanley Kubrick’s sword-and-sandals epic Spartacus (1960) and Joseph L. Mankiewicz’s Cleopatra (1963) are certainly memorable; indeed, both were nominated for Academy Awards. Mauceri’s two-part Cleopatra Symphony seems oddly muted though, and the LPO don’t sound terribly engaged either. Incidentally, Kubrick also commissioned North to write the score for 2001: A Space Odyssey (1968); one of film history’s great what-ifs it’s well worth hearing. Mauceri’s ‘symphonic portrait’ based on Nino Rota’s fine score for Francis Ford Coppola’s The Godfather (1972) is rather more varied and interesting. Despite being a stylistic hotch-potch it hangs together reasonably well, which isn’t often the case with such syntheses. Rota was old school, and his score for Luchino Visconti’s 1963 film Il Gattopardo (The Leopard) is one of his finest creations. For a thoroughly enjoyable recording of excerpts from the latter do seek out Riccardo Muti’s Sony recording with the La Scala Philharmonic. You might also want to try this new Capriccio album, which so impressed my colleague Simon Thompson recently. Speaking of old school film composers one must include Franz Waxman. The Ride of the Cossacks, from his Academy-Award-nominated score for Lee Thompson’s 1962 film Taras Bulba, is a true classic. Superbly orchestrated and very dramatic indeed it gets a fine outing here. However, Mauceri and the LPO are no match for Charles Gerhardt and the National Philharmonic, whose 1974 collection of Waxman stunners includes the music to Billy Wilder’s Sunset Boulevard (1950) and Henry Hathaway’s Prince Valiant (1954). HDTT have made new transfers of this disc, which I hope to review at some point. The Waxman piece – one of the few on this album that’s presented in its original form – is such a fine example of the film composer’s art. Pithy, powerful and utterly memorable it’s apt to put Mauceri’s otherwise admirable arrangements in the shade. Besides, Decca provided Gerhardt with a recording that’s hard to beat. By comparison the LPO sound seems rather average, with little of the frisson that makes the Decca album so special. As for Gerhardt's orchestra they connect with this repertoire in a way that Mauceri's players don't always manage. That said, the latter make amends with a strongly characterised account of Bernard Herrmann’s own ‘narrative for string orchestra’ based on his iconic score for Alfred Hitchcock’s Psycho (1960). Mauceri also included it on the Toccata issue I mentioned earlier; this new LPO version is much tauter and it’s better played as well. As a piece it really works, for it welds the film’s main themes and events into a very cohesive and convincing whole. And goodness, the bird-like shrieks that accompany the shower scene and the plunging bass as Marion’s blood swirls down the drain are as chilling as it gets. The little-known Polish composer Bronislaw Kaper’s score for Lewis Milestone’s 1962 film of Mutiny on the Bounty is actually rather splendid; even in this arrangement it has all the surge and spray one could wish. It also features typically lush interludes and musical hints of the South Seas. Not in the same class as, say, Korngold’s The Sea Hawk perhaps, but a very decent score nonetheless. The LPO certainly sound like they’re having fun with this one. Indeed, they seem to relax and enjoy themselves as the concert goes on. Moving from sailing ships to starships Jerry Goldsmith’s wife commissioned him to write The New Enterprise, an eight-minutes set of variations based on music from Star Trek – The Motion Picture (1979). Presented in its original orchestration this really is a beautifully crafted piece; glowing, seamless and supremely well played it’s one of the best things in this collection. How very different from Henry Mancini’s arrangement of ‘Deborah’s theme’ from Sergio Leone’s spaghetti Western Once Upon a Time in America (1984); pleasing enough it’s a bit too soupy for my tastes. As for the desert vistas of David Lean’s Lawrence of Arabia (1962) they’re well caught in this dramatic snippet from Jarre/Mauceri. From what I can gather the last two items were presented as encores. These push the album’s total playing time to nearly 90 minutes, so that means spreading the music over two discs. However, the set is priced as a twofer (around £10). The 16-bit download will cost you a comparable £10.40 from eClassical, but Presto want nearly double that for the same files (£19.17). As if that weren’t extortionate enough Presto have the cheek to charge £27.98 for the 24/96 version. If you must have the latter Qobuz are offering it for £17.59. Bear in mind these prices were current at the time of writing (September 2015) and they may change. Now, back to the music. The original scores are the best things here, but then Mauceri’s Bounty arrangement is pretty impressive as well. The conductor’s liner-notes are very readable and the audience is very quiet. There’s no applause. Not an unqualified success, but still worth hearing; a fair recording, too. The list of famous concert-hall composers who have written music for the cinema is substantial and includes such illustrious names as Copland, Vaughan Williams and Walton. Many others have achieved their principal claim to fame through the music that they have written for the silver screen. Just because the latter may be better remembered for film scores than for concertos and symphonies doesn’t mean that they are in any way inferior as composers. On the contrary, these are serious musicians and the best film music reveals inspiration and great technical skill as the composers represented in this set confirm. Nor should that surprise us since many of the composers selected here by John Mauceri were trained at leading conservatoires and colleges, including the Juilliard School (Alex North and Bernard Herrmann), the Curtis Institute (North and Nino Rota), The Santa Cecilia Conservatoire in Milan (Rota), the Warsaw Conservatoire (Bronislaw Kaper) and the Paris Conservatoire (Maurice Jarre). John Mauceri has spent decades not only performing this sort of repertoire – and a great deal of concert and operatic music also – but also subjecting the scores of films and musicals to practical, scholarly revision. Nor is his interest in the music ‘merely’ academic; he conducts it with flair. As will be seen from the track list, almost all the music on this programme is presented in editions that he has made. So, we’re off to the movies with Mauceri and the LPO. We’ve taken our seats, bags of popcorn at the ready, and as the lights dim the first thing we hear is Alfred Newman’s 20th Century Fox Fanfare. Short it may be but it’s been known to cinemagoers the world over for decades. And marvellously effective it is too. Newman, incidentally, was no hack composer: he had private lessons with Schoenberg, no less. His fanfare is, arguably, the only way to start such a programme. Right, it’s time to settle down for the first main feature. It comes in the form of music that Alex North composed for the 1963 Liz Taylor/Richard Burton epic, Cleopatra. As an aside, I was intrigued to learn from a bit of web research that so costly was this film to make that it has the dubious distinction that it is the only film to have achieved the highest gross box office takings in a year and still made a loss. John Mauceri describes North’s score for the movie as his masterpiece; it was nominated for an Oscar. Responding to a commission from the composer’s widow, Mauceri has used the original material in 20th Century Fox’s archive, “conflating and arranging the immense score into two symphonic poems.” These are entitled ‘Caesar and Cleopatra’ and ‘Antony and Cleopatra’. The only snag with what we hear is that, shorn of the visuals, it isn’t always clear what North is illustrating in music – though often it’s easy to guess. However, there’s no doubt that the orchestration, which I presume is North’s original scoring, is masterly and inventive. The music, too, is full of interest and though it comprises episodes, often short, these have been skilfully woven together. The music is sometimes lush, sometimes romantic and sometimes exciting. As an example of North’s craft, both as a melodist and an orchestrator, sample the sumptuous string melody with which ‘Antony and Cleopatra’ opens. Next, Mauceri “makes us an offer we can’t refuse” with music that Nino Rota composed for the first two Godfather films (1972 & 1974) - he was dead before the last film in the trilogy was made. Mauceri explains that he has re-ordered music from Rota’s scores – but only using the composer’s material – to “tell the story of the Corleone family chronologically, unlike the films.” The two films cover a period from 1901 to the late 1950s so Rota’s score includes a wide variety of musical styles. The result, ingeniously knitted together by Mauceri, is an evocative and colourful pot pourri ... and yes, this “symphonic portrait” does indeed open with that famous, haunting trumpet solo. Just before the intermission we’re taken on a wild ride, courtesy of Franz Waxman. ‘The Ride of the Cossacks’ comes from his music for the 1962 film Taras Bulba, which starred Yul Brynner as Taras Bulba and Tony Curtis as his son. The music is very different to Janáček’s take on Gogol’s story but it’s vivid and exciting, as is the LPO’s performance. After this we need to get our breath back – and an ice cream – in the intermission. The second half of our evening at the movies begins in a serious vein with music from Bernard Herrmann’s score for Alfred Hitchcock’s celebrated psychological thriller, Psycho, which starred Anthony Perkins and Janet Leigh. No one who has seen the film is likely to forget the terrifying scene in which Leigh is murdered while taking a shower, hacked to death by a knife wielded through the shower curtain. Hitchcock’s use of black & white film and Herrmann’s graphic, slashing music made the scene all the more shocking. The music that’s heard here was composed as a standalone concert work by Herrmann in 1968, drawing on music from the film score. It was never performed in his lifetime and eventually the composer’s widow asked John Mauceri to make a performing edition. The result is a deeply serious work for string orchestra which should, by rights, enter the concert repertoire. The piece, which plays continuously, strikes me as being extremely well written for strings and the music is of no little substance. The famous ‘slashing’ motif is heard at 6:07, when it makes a vivid contrast following immediately on from a quiet but far from tranquil section. The ‘slashing’ music reappears later, at 11:20. This is a highly charged and unsettling piece and, as I say, it deserves to become a concert repertoire piece. Bronislaw Kaper wrote the music for the 1962 film Mutiny on the Bounty, which starred Marlon Brando and Trevor Howard. It is, dare I say, more conventional film fare but like everything else on this programme it’s well worth hearing. Kaper’s bold opening seems almost brash when heard immediately after Herrmann’s piece. The ‘Storm at Sea’ episode is pretty vivid – though not as good as Britten’s storm in Peter Grimes. At 5:19 there’s evidence of Kaper’s wish to impart a South Seas feel to the music when we hear offstage unaccompanied chanting by male and female voices – this, I presume is the start of the ‘Girls and Sailors’ section which then evolves into a boisterous orchestral dance. The final section is ‘The Death of Christian’ and here the music is restrained and sorrowful. The offstage singers are heard again towards the close, this time accompanied by suitably South Seas orchestration. The score was nominated for an Oscar. From the South Seas Mauceri and the LPO “boldly go” into outer space. Some of Jerry Goldsmith’s Oscar-nominated music for the 1979 film Star Trek – The Motion Picture is presented here in concert version by Mauceri, made at the request of Goldsmith’s widow. Mauceri describes the present piece as “an extended series of variations to accompany the newly promoted Admiral Kirk’s eight-minute voyage of discovery to view the refitted starship.” Goldsmith’s music suggests vast distances and wide vistas – perhaps “galaxies far, far away”? The score is big-boned and suitably aspirational in tone. Coming back down to earth we hear ‘Deborah’s Theme’ from Ennio Morricone’s music for Sergio Leone’s 1984 gangster movie, Once upon a time in America, which starred Robert DeNiro. Orchestrated by Henry Mancini, this music is gentle and appealing. Morricone won a BAFTA award for his score. There’s time for a short encore. Don’t rush to leave the cinema while the final credits are rolling or else you’ll miss music included at the LPO’s own request. It’s not surprising that they should want to end with a reminder of Sir David Lean’s great 1962 epic Lawrence of Arabia because the orchestra played on the original soundtrack. The film won no fewer than seven Oscars, including the coveted Best Picture award and also Best Director for Lean. Maurice Jarre picked up an Oscar for his score. The short taster of the score that John Mauceri has produced includes the great sweeping Main Titles theme, surely one of the most memorable melodies written for the silver screen. Jarre’s music is a fitting end to our trip to the cinema. I didn’t expect to receive this set to review – it’s rather off my usual beat – but I’m jolly glad I did. I enjoyed these discs enormously. Much of the music is great fun - I say “much of” because it would be wrong to classify Herrmann’s excellent piece in that way. There’s a good deal of musical escapism here and I don’t for one second mean that in a negative sense; the music is “escapist” in the way that the cinema itself often is. However without exception the music on this programme is highly imaginative; it’s also expertly written and scored. The performances are excellent. There’s no sense of the LPO relaxing or being in holiday mode. They bring the same evidence of thorough preparation and the same commitment that they would to a Mahler symphony. The playing is razor-sharp where needed but equally they clearly relish the sumptuous melodies that frequently come their way. Mind you, I’m sure it helps that there was an acknowledged expert in the field wielding the baton. If further evidence were needed that this was a serious musical occasion it should be recorded that the concert in question took place as part of the 2013 The Rest is Noise festival, a year-long exploration on London’s South Bank of twentieth century music inspired by Alex Ross’s magnificent and provocative book of the same name. It only remains to be said that the recordings themselves are excellent – clear and present. The documentation is all authored by John Mauceri who wears his scholarship lightly in informative and enthusiastic essays. Mauceri and the LPO treat us to a great night at the movies. I hope you’ll enjoy it as much as I did.